Try before you buy. It's sage advice to take before you make a big investment and it's no different when choosing a learning management system (LMS). An LMS free trial is a crucial part of your selection process. It's software that will be used frequently and it needs to be properly tested. Most, if not all, vendors worth their salt will offer a free trial. However, many are pretty strict on how long your trial lasts. So if you have a short window, perhaps only a couple of weeks, you need to make your LMS trial work for you. As one of LearnUpon's account managers, I chat to prospective customers about how to make the most of their LMS free trial every day. I've learned the best ways to squeeze every opportunity out of a trial, and today, I'm passing these tips on to you to ensure you select the right LMS for your organization. Before you even start your LMS trial, many vendors offer a product demo. Your instinct might be to skip it, expecting a sales pitch, but don't! If you have a list of potential platforms it’s essential to get a demo of each one. The demo is your main opportunity to consult an expert about how the platform fits your use case. You get a better understanding of how the LMS works and, importantly, you get to ask questions. You can discuss features and your use case. Like for example, if a feature or requirement is critical, ask the LMS demonstrator how the platform measures up. They'll be able to tell you straight away and you don't run the risk of missing it when trialing. Equally valuable is the ability to share your doubts, and get reassurance that your team hasn’t made false assumptions about the platform. If the demo goes well, great. On to your free trial. And if not, you only spent an hour finding out, instead of weeks testing a platform that isn't right for you. Post demo, it’s common that organizations create a shortlist, 4-5 LMS vendors at most, and they trial each one. No two trials are the same though. Some vendors are flexible, while others are pretty rigid about trial expiry dates. So, be sure to check the fine details of your trial. You don’t want to be locked out of the LMS mid testing. At LearnUpon, we’re open to extensions. We know no two businesses are the same, so if you need more time, there is no harm asking for a longer trial. I’ve noticed wise businesses also schedule their LMS free trials in the right sequence. Too many trials at once is overwhelming, however you don’t want to drag out the process and be playing with platforms for months. 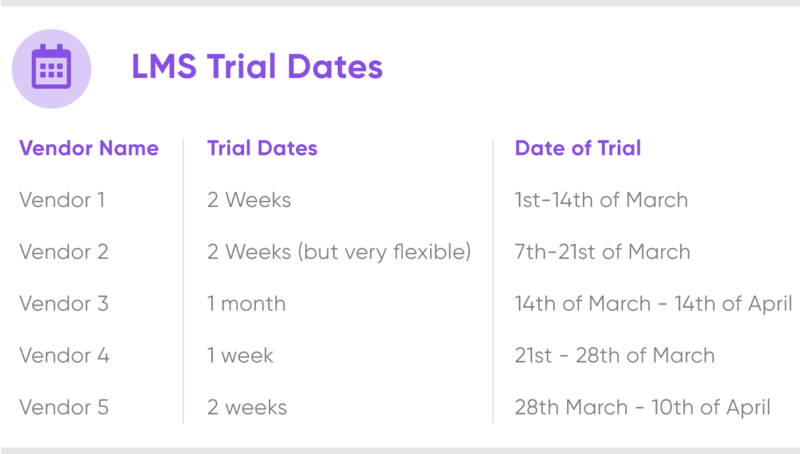 Planning two-to-three trials that have some crossover means that you can get through your trials pretty quickly, but you’re also not bombarded with too much at once. It should give you a clear picture of each LMS and make the selection process much more structured for your team. Gaining the most value out of your free trial is about treating the process as a pilot of the LMS you’ll eventually select. We like to call it the ‘proof of concept‘ stage. But, before you even log-in to any LMS, assemble a project team, otherwise known as your guinea pigs. This team, which should include individual users assigned the roles of managers, admins, and learners, will fully test the LMS. Brief each team member about the process, your expectations, and the outputs you need to make your selection. Then add them to your LMS. As each platform is played with, your team should measure performance closely against your requirements. By the end of the LMS trial, you'll easily rule out a couple of solutions, but the selection may now hinge on how feedback from each trial compares against the other shortlisted platforms. A free trial doesn't mean simply logging into a system and clicking a few buttons. To get real value, you need to simulate a real training environment. 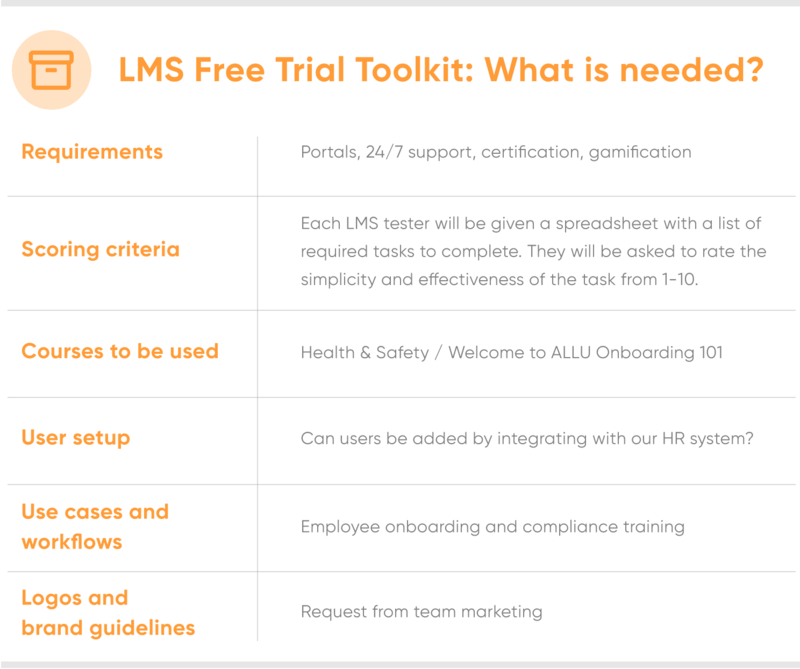 You need an LMS trial toolkit. If it's your company's first LMS, a trial will be less realistic so base it as closely as possible on your requirements. Before the trial, create workflows that reflect how you expect the LMS to operate. Then, populate the workflows with dummy users and courses to get a realistic sense of how the training platform will function day-to-day. If you already have an LMS, your trial will probably be more true to life. You’ll have sample user details and course content that you can upload to mimic training processes. However, don't just simulate how your training currently works, but also imitate how you would like it to work for you and your organization. Remember, we're looking to simplify and better your process, not stick to the same old same old. Requirements: An exhaustive list of requirements is the foundation of an effective LMS selection process. Every LMS free trial you conduct must be rigorous enough to ensure that the system is measured against all requirements. Requirements also act as a set of scoring criteria. Allocate responsibility for vetting individual requirements to the most relevant member of your team. Scoring criteria: Requirements shouldn’t carry equal weight. Instead, they should be carefully prioritized so you can assess and compare learning management systems on the same terms. All team members involved in trialing an LMS should score the same set of requirements for assessment later. Use cases and workflows: These documents help to simulate how the system should and can work in your organization. Proper courses: Adding realistic content and working through a simulation of your training processes will offer the most genuine sense of user experience. Proper user setup: Add a viable volume of test users to every LMS that you trial. Users should be organized in ways that reflect your company’s structure, processes, and channels of communication. For example, you could group users by department, job role or both with the relevant manager assigned to that group. Logos and brand guidelines: You should brand the learning portal so that it reflects the look and feel of your organization’s other platforms and materials. That will also help team members to assess systems on the same terms and avoid being distracted by cosmetic differences between platforms. Some prospective customers are reluctant to speak to LMS vendors. Again, fearing a sales pitch or not wanting too much interaction. That’s a mistake. If a vendor contacts you during an LMS free trial, take advantage of the opportunity. Why not see what they are offering? It's likely to help you decide if it's the right solution for you. Most of these documents – customer stories, references, reviews, and testimonials – are useful for assessing a vendor’s reputation and experience in your industry. Technical documentation and a product roadmap helps determine, not just what the LMS looks like now, but what it will become. It's a mistake to dismiss a great vendor just because a single feature is missing so check to see if it's coming down the line. Technical team members can help evaluate each learning management system’s API and other technical capabilities - critical if you need to customize the LMS to meet your most specific requirements. The roadmap also show how the LMS plans to keep pace with a rapidly evolving Learning & Development landscape. Comparing product roadmaps between vendors provides a sense of the relative scale of their ambition, innovation, and investment in development. During every LMS trial, remember: you’re not just testing the LMS software, you’re testing the vendor too. You need to have confidence in your vendor to provide a helpful, user-friendly experience. And if you don’t, they’re not the right solution for you. But if a provider is generous with their time and expertise, you’ll be reassured that they will always be on-hand to help. The breadth and depth of answers offered to technical and commercial questions is a top indication of the strength of their team and investment in resources. Don’t be afraid to properly test customer support before your trial concludes. First, test how support works within the platform itself. Submit requests based on problems and pain points you have already experienced or anticipate. Keep a record of response times and how satisfied you are with the support your team receives. Pay attention to automated responses and superficial answers that indicate a vendor isn’t really dedicated to customer support. And finally, see how willing the vendor is to be flexible. Rigidness with processes and timelines should raise concerns as to what you can expect as a customer. At LearnUpon, we’ll happily work with a business trialing us. After a trial ends, your portal remains intact, it can be reactivated if you need to return to it later in your selection process. It’s no big deal. With LearnUpon as your LMS, we immediately deploy your portal so the work you’ve done during your LMS free trial is retained for future use. It gives you a head start, allowing a smooth transition and efficient launch. When it comes to trialing an LMS, it’s easy to underestimate its importance. But to give your business the best opportunity at training success, look at a trial as a powerful tool. One that helps you see how the LMS will really work, giving you full confidence in your final selection.